Ability manufactures abilox®, an extensive range of fine, UV resistant, inorganic mineral oxide colouring pigments. abilox® powder colourants are used for permanently ‘through’ colouring concrete, asphalt, mortar, surface coatings, caulks and sealants, applied finishes, adhesives and other composite products and materials used in the building and construction industries. abilox® is available in a variety of attractive colours. 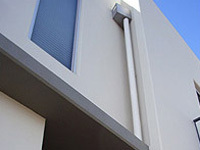 abilox® is part of a range of versatile, safe for the environment exterior/ interior products developed by Ability. These pigments, when for example, are used in the company’s range of long life paints, offer clean air technology with NO SOLVENTS, NO VOCS (Volatile Organic Compounds), contain little or no odour, are extremely weather resistant and offer durability for decades. These and many other features make non-toxic abilox® a colouring product in a superior class all it’s own. Ability’s abilox® mineral oxide mix-in powder colours are used in all types of cast-in-place, slab-on-grade, precast, tilt-up and ornamental concrete, as well as in sprayed concrete (shotcrete), masonry and rendering mortars, concrete masonry units, pavers, retaining wall units and concrete roofing tiles. abilox® 100% active powder colourants can also be used to colour cast ‘stone’, external wall ‘plastering’ and ‘bagging’ mixes, stucco, interior ‘solid’ gypsum / lime wall plaster and other gypsum cement and / or hydrated lime bound construction materials. Pure, concentrated abilox® powder pigments are made of high-quality metal oxides recycled from iron and steel or refined from the earth and are specially processed for mixing into concrete. These UV resistant mineral colourants comply with ASTM C979-1999 ‘Pigments for Integral Colouration of Concrete and Mortars’, British / European Standard BS EN 12878-1999 ‘Pigments for Portland Cements and Portland Cement Products’ and Australian Standard ‘Colour Pigments For Use with Portland Cement’ ASK54-1935. They are lightfast, alkali resistant, weather resistant, durable and long lasting like good concrete. Ability’s colours are available in a wide spectrum of over 60 standard colours and additionally can be custom formulated to match architectural colouring design requirements for concrete, mortars, etc. abilox® comes in Ability’s Concrete-Friendly® sacks which are bio-degradable bags that are simply added into a concrete mix without having to be opened or poured. These are water sensitive, (ie: have a low wet strength) and disintegrate when water saturated and fully mixed into the concrete leaving no bags to dispose of into the environment. Integrally coloured concrete is installed the same way as high quality, uncoloured concrete. If coloured concrete is required, it is suggested that a colour is chosen from those shown on the inside of this abilox® colour specifier or from Ability’s coloured concrete / mortar ‘biscuits’ and to specify this colour by colour name, dose rate and the colour of cement eg: Grey Cement (GC) or Off White Cement (OWC). With the provision of an adequate mixing action and mixing time, the intensity of colouration is directly proportional to the dose rate of colour added to the mix. Confirm the desired colour and dose with a fully cured architectural sample (job site test panel). Typical dose rates range from 4.15% and 8.3% by weight of the cementitious binding material or 12.5kg or 25kg per cubic metre of concrete, or 2kg to 4kg per nominal 40kg bag of cement or blended cementitious powder binder content. Cementitious binder content includes: Portland cement with fly ash, silica fume, ground granulated blast furnace slag powder as well as lime and other cementitious materials but does not include aggregate or sand. 2) A procedure adopted to retain this water (immediately after setting) over the many days of it’s reaction with the cement, called ‘curing’. abilox® colours have been, over many decades, used successfully in the widest variety of concrete mix designs and are compatible with commercially available admixtures for pre-mixed concrete and mortars. The only known incompatibility is with calcium chloride set accelerator, which may cause blotching, discolouration as well as the increased likelihood of the occurrence of efflorescence with increased concrete shrinkage and reinforcement corrosion. Unset concrete has a mouldable / castable quality which lends itself to a variety of creative results. Different surface textures can be obtained by utilising: surface textured forms (shutters), or form liners. Paving and floors can be finished with pattern stamped, broomed, trowelled, exposed aggregate, texture rolled, ceramic motif /tile impressed, art image pressed or many other visually appealing textures and finish effects. Set and partially hardened, coloured, cast-in-place, pre-cast and tilt-up concrete structures can be textured with grit blasting, bush hammering, grinding and honing and polishing. Ability’s Duro-Seel Clear is a non-clouding, spray on cure and seal coating that meets and exceeds ASTM C309 and AS 3799 -1999 ‘Liquid membrane Curing Compounds For Concrete’ and is specially formulated for coloured paving concrete and decorative exposed aggregate finishes. Other curing procedures, such as water spray curing or the laying of plastic sheets, may cause discolouration. Ability’s Duro-Seel Clear, and the new coloured Durosheen® sheen coating are optional, film forming, pigmented concrete sealers available in a range of standard colours (or tinted to suit abilox® colour specifier range of shades). Our Duro-Seel Clear products help to provide a uniform appearance over coloured concrete. More detailed information regarding Ability’s range of surface coatings for concrete products and all other surfaces are available upon request. For optimum results - the materials, curing procedure, weather conditions, workmanship - especially the concrete finishing process - should all be uniform throughout the project. Quality starts with the concrete mix; use a low water content, high performance mix design - preferably a minimum, normal class 32MPa compressive strength at 28 days (N32 grade). When planning a project, budget for the cost of good craftsmanship. Concreting or plastering contractors are independently owned and operated without affiliation to Ability or the supplier of the premixed concrete or the supplier of mortar / plastering materials. It is strongly advised that a qualified contractor be chosen, experienced in coloured work who can provide information and examples of finished projects which can be inspected before enlisting their services for your next project. When selecting a colour from this Colour Specifier please specify it by name, pigment percentage (dose rate) and whether it is for off white cement (OWC) or for grey cement (GC) bound materials. For complete Architectural and guide specification information, please refer to our Architectural Presentation Pack binder. Our guide specification entitled ‘For All Specifiers - A Suggested Building Specification For Coloured Concrete’ is available on request. It is important to use the same pigment-to-cementitious binding material ratio, concrete mix design, type, brand and colour of cement and aggregates throughout the project. Changes in cement and aggregate colour as well as the other items, will affect the final colour. Prepare a well-drained sub-grade over which to cast the concrete. Add a 50mm to 100mm thick layer of suitable sand, gravel or crushed stone depending on the soil condition report. Uniformly compact the sub-grade and moisten evenly and uniformly leaving no puddles, standing water, ice, frost or muddy areas. If a polyethylene sheet vapour barrier is used, overlap sheets and tape over any holes in the sheet. Depending on the intended concrete thickness, place a 75mm layer of granular, self-draining, compactable fill over the sheet to help minimise shrinkage cracking. Position forms for uniform slab thickness. Follow Australian Standards, Cement Aggregates & Concrete Association (CC & AA) and /or Concrete Institute of Australia (CIA) recommendations for excavation, sub-grade preparation, steel reinforcement and joint placement to control visible cracking. The sequence of proportioning, raw materials and the mixing time at the concrete transit mixer’s mixing barrel speed (as compared with the much slower agitator barrel speed which does NOT mix concrete) for small coarse aggregate mixes to ensure that Concrete-Friendly® sacks are wetted fully and disintegrate completely should be determined by your testing. (Refer to Ability printed data ‘Using Ability’s Concrete-Friendly® sacks). Allow ample time and staff for placement and finishing work. Finish uniformly, evenly with care.Begin trowelling after any surface bleed water evaporates. Late or excessive hard trowelling and edging may cause irregular ‘burns’ or dark spots. Water added at the job site to concrete in a transit mixer or when pumping will cause the concrete colour to pale. Avoid this or keep additions to a minimum and consistent among loads. Don’t wet finishing tools, brooms or sprinkle water on the surface. Do not sprinkle pigment or cement onto the surface. Rotary ‘helicopter’ power trowel, dry-broom, pattern stamped or rough wood float, uniform finishes may harden to a more uniformly coloured result than very smooth steel trowelled finishes. Cure coloured concrete with Ability’s Duro-Seel Clear or another good curing compound. Data and free samples of Duro-Seel Clear may be obtained by contacting Ability by phone or please email us your request. Do not use plastic sheets, water curing or curing products which discolour. Wood and other objects left on set and slowly hardening concrete may cause discolouration. Efflorescence is a ‘bloom’ of a white crystalline substance that may appear on concrete surfaces. A result of water evaporation, it is more noticeable on coloured surfaces making them look faded or lighter in colour when not removed. Low water: cementitious ratios and /or the use of Ability’s unique admixture called Efflorein® Mark 2 the adoption of a suitable concrete curing procedure and protection against water penetration reduces the tendency for efflorescence to occur. Remove with detergent or mild acid cleaning compound formulated to remove efflorescence. Follow cleaning compound instructions and test on a small area to make sure the compound will not unevenly etch or discolour the surface. Always wear rubber gloves and eye protection. As the conditions of use and application of our products are beyond our control, Ability Building Chemicals P/L makes no warranty of merchantability or fitness for any particular purpose and expressly disclaims liability for consequential or incidental damages whether based on warranty, misuse or negligence.